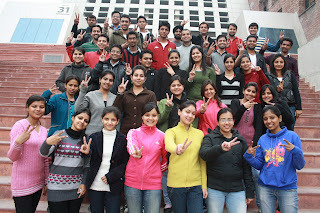 Jalandhar: A leading IT Company & recognized worldwide as a pioneer of remote infrastructure management services, HCL Comnet has recently selected 63 (Sixty Three) students of Lovely Professional University. Selected under a Joint Campus Drive, these students of B.Tech ( CSE/IT/ ECE), Batch 2012 (Final Year) will join their new assignments as Trainee Software Engineers, at Salary Package of 2.75 lacs per annum in the month of June 2012. Prior to this selection, the students had undergone a very meticulous recruitment criterion. In fact, many other renowned IT, Pharmaceutical, Engineering, Management & Hospitality Sector companies recently visited University campus for suitable placements of students. On these lines, more than 6000 LPU students have already been placed with many top companies so far. Congratulating the brilliantly successful students, the Director General of the University, Er HR Singla said: “Students getting recruitment at such a reputed firm is indeed a moment of pride for us.” He also said: “Sincere efforts made by aspiring students for such placement drives are worth commendation. We regularly try to provide the best placement to our students, believing and persevering that maximum number of students get placed every session.” He also expressed his happiness on seeing the students’ propagation towards becoming the proud alumni of their alma-mater, within a very short span. As per the survey for the last 4 years consecutively, HCL Comnet is amongst the only 2 companies to be ranked in the Best companies to work for in India. The HCL team comprises 24,000 professionals of diverse nationalities, who operate from 26 offices across 15 countries including 170 offices in India. HCL has global partnerships with several leading Fortune 1000 firms including several IT and Technology majors. There is a website of internship letter of motivation which will be helpful in your study. I would so love you to feel better about yourself. The reference page generator can also build your credibility to your readers and that you can help them verify and perform additional consulting or study with the references using the reference page generator free. Nice Blog..!! here is the sharing best training institute for java and testing...! !